This post has been edited to reflect a change in price listed. The correct price is now shown along with where I changed it. Thank you for your support. Advanced Gunslinger Armament is a veteran owned and operated company, and was founded by a Navy SEAL. They’ve created the Hybrid Instant Transition Sling, or HIT Sling, and it’s the most advanced sling on the market. A lot of people find that 2 point slings are great for most things and that a single point sling is great for combative fighting and competitive shooting. Combining a 2 point and single point sling is nothing new, the real creativity shines in the fact that you never lose retention of your weapon. 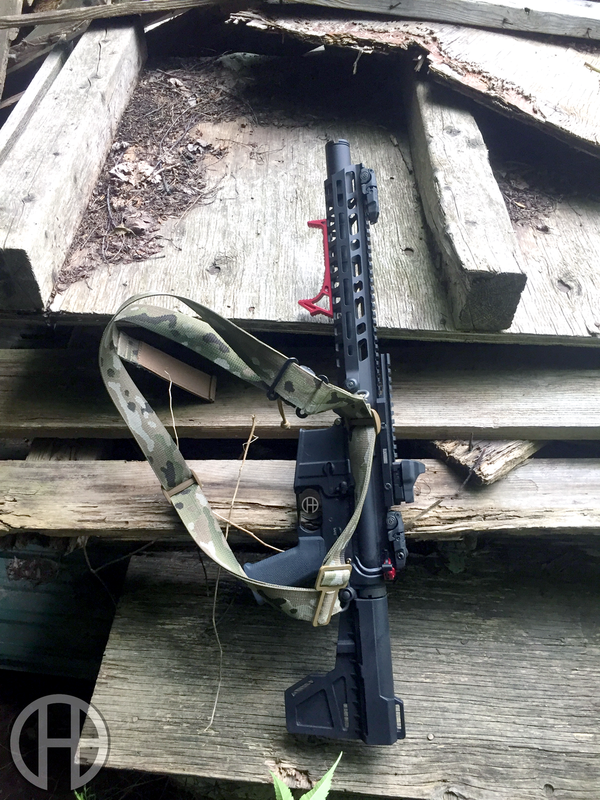 With all other transitional slings on the market, you detach your sling from the front of the rifle, and then attach it to a secondary point, typically on the sling itself. In the moment, Murphy’s Law will undoubtedly come into effect. The very last thing that you’d want to happen is lose your weapon, which is possible in that couple of seconds it takes to switch. That’s not a terrible thing shooting a competition, or even training, but this was designed and built for the occupational shooter. Here's a video that shows how fast you can change and how secure it is. Not knowing when the bad guys are going to be engaging you, you can’t pre-switch your sling to a single point. So you’re left walking around with it as a single point all day, a 2 point which has its drawbacks for fighting, or constantly switching when you think that you’re gonna be needing it. 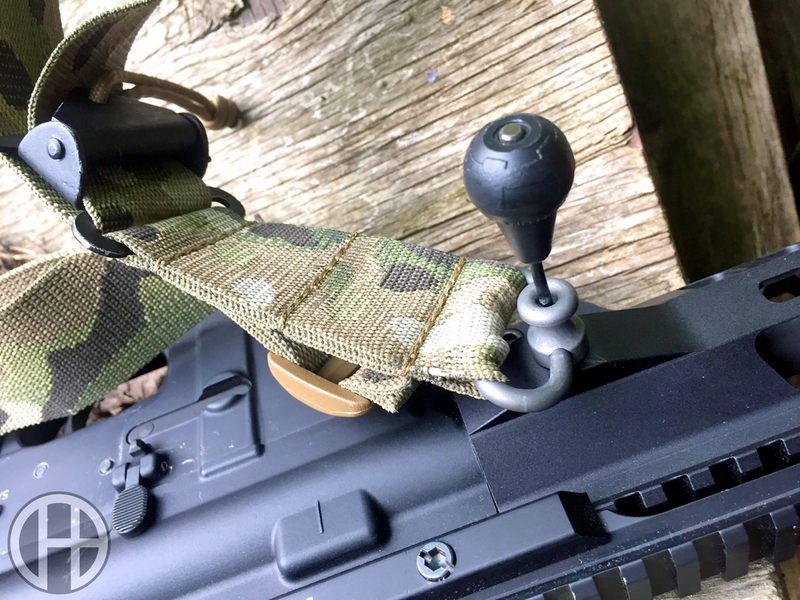 The HIT Sling solves that problem with a lightning fast pull knob(Blue Force Gear RED Swivel) to release the front attachment as soon as you need your weapon. When the fighting's over and you need to use your hands, simply reattach the front mount, and you're hands are free. Whether you need to search people or climb a ladder, your weapon isn’t going anywhere as you can cinch it down tight against your body. Personally, I’ve not been able to tighten it down enough that I couldn’t deploy it effectively. To tighten it, they sew on a piece of semi-rigid nonskid material so you can easily identify it and grip it without ever looking down. All of that is not to say it can’t be beneficial in the civilian and competitive markets. Much like other military/police gear, it lends itself to other disciplines pretty well. Think about a shooting class where you don’t have to worry about your firearms flopping around while you check targets, or running to the next course. Or for hunting, and you can easily secure your weapon as you drag your deer back to camp. The use of this product in the mil/leo market is a no brainer (they offer a discount). For civilians, you need to take a look at your wants and desires for a sling to decide if this is right for you. It’s my opinion that the sling would be great for everyone though. It opens up so many opportunities for success and has very few points of failure. I know I’ve already convinced at least one of my friends to switch over from another major brand. In my personal use of the sling I’ve found it to be comfortable to wear for a long time. It’s easy and fast to deploy with the Blue Force Gear RED swivel attachment, after a slight break in period. It’s easy to set up and easy to adjust for different rifles. All of the vital hardware is made from metal and either covered or isolated. You’ll be sure to find the sling that meets your need with all of the different color options and attachment types. As low as $65 (Removed $52) with no rear attachment, or $70 (Removed $60) with one. There’s no better place to buy a sling than the manufacturer. Some items and configurations can be on backorder.